46 year old Jennifer Phillips was arrested Tuesday and charged with threatening a government official. Phillips was a volunteer with the Santa’s Workshop program at the Liberty Elementary school where Haley was scheduled to speak. Phillips made the following comment to a volunteer prior to Haley’s appearance, “I’m going to smuggle a gun in and kill this Governor.” So much for ‘Tis the season to be Jolly. I am thinking that some one has forgot the “reason for the season”. What kind of an idiot makes such a comment while volunteering among children? A moonbat Leftist of course. A woman has been arrested and charged with making a threat against South Carolina Gov. Nikki Haley. Liberty police say 46-year-old Jennifer Phillips was arrested Tuesday and charged with threatening a public official. A district spokesman says Phillips – who was a volunteer with the Santa’s Workshop program at the school – made the remark to a school employee around 8:30 a.m. Tuesday. I am going to go out on a limb and say, one, Jennifer Phillips did not vote for Nikki Haley in the 2012 elections and two, this will be the last time she is ever allowed to volunteer in a school. As Wil Farell said in Elf, she must have been an angry elf. Barack Obama, Lost in smallness yet again, add in some snark and a dash of sarcasm as he commented on the RNC, ‘It should be a pretty entertaining show’. Just how petty could this president get? Dear Mr. President, it may have been truthfully entertaining; however, it was more enlightening, inspiring and invigorating! Let me inform Barack Obama and the Democrats, don’t look now but the GOP has a young, deep, diverse bench. As stated at Hot Air, “a whole gamut of Republican governors did indeed take to the stage to refute your erroneous “top-down” baloney this evening, in the knowledge that a huge, meddlesome bureaucracy that thinks it knows best and taxes success is the real definition of “top-down.” The GOP governors told the success stories of their own states recoveries that were polar opposites of Obama’s failed bottom up, middle out, government dependent nanny state agenda. Ahead of the Christmas holiday, Obama’s DOJ rejects South Carolinian’s voter ID law under the cloak of darkness. COWARDS! What else would we expect from these people? Document dumps on a holiday weekend and playing the race card, for the Obama Administrations they go together like peas and carrots. These people will do anything to keep such an event from the news cycle. Especially as Weasel Zippers opines, consider the fact that polls show 70% support voter ID laws. Once again the Obama Admin will be taking on a “Red” state government. What, me use the race card … never ALWAYS! The Obama administration entered the fierce national debate over voting rights, rejecting South Carolina’s new law requiring photo identification at the polls and saying it discriminated against minority voters. Friday’s decision by the Justice Department could heighten political tensions over eight state voter ID statutes passed this year, which critics say could hurt turnout among minorities and others who helped elect President Obama in 2008. Conservatives and other supporters say the tighter laws are needed to combat voter fraud. In its first decision on the laws, Justice’s Civil Rights Division said South Carolina’s statute is discriminatory because its registered minority voters are nearly 20 percent more likely than whites to lack a state-issued photo ID. Please, spare us the BS. In a post 9-11 world, we have to show picture ID at the airport, is that discriminatory? We have to show it to the police, is that discriminatory. When you are on a cruise ship or train, you are asked to show ID. When you get a drivers license you must show ID. Oops, looks like I forgot a couple more. Thanks to the Lonely Conservative, she ads to the list of photo ID requirements, purchasing alcohol or cigarettes, entering a state or federal building or cashing a check. HOW DISCRIMINATORY!!! So something as important as voting doesn’t require that we ensure the sanctity of the process. REALLY? 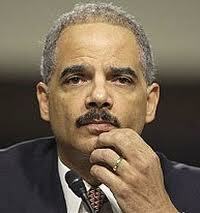 You mean Atty General Holder and Barack Obama are not concerned about voter fraud? From the people who did nothing against the Black Panthers in their voter intimidation case … say it isn’t so. South Carolina Gov. Nikki Haley is correct in calling the actions of the DOJ outrageous.Presently, the SC voter ID law requires and individual to show one of five forms of photo identification. The Republican-led legislature passed the law earlier this year, and proponents said the identification requirement is needed to ensure balloting is free from fraud. Civil rights groups say the law threatens to infringe on the rights of voters who don’t have driver’s licenses and may not have the means to pay for documentation to get state-issued IDs.